The original 97-cc Splendor changed the face of the Indian commuter scene in the late 1990s by providing a reliable, no-frills and fuel-efficient workhorse for the masses, and went on to become the number-one-selling bike in the world. 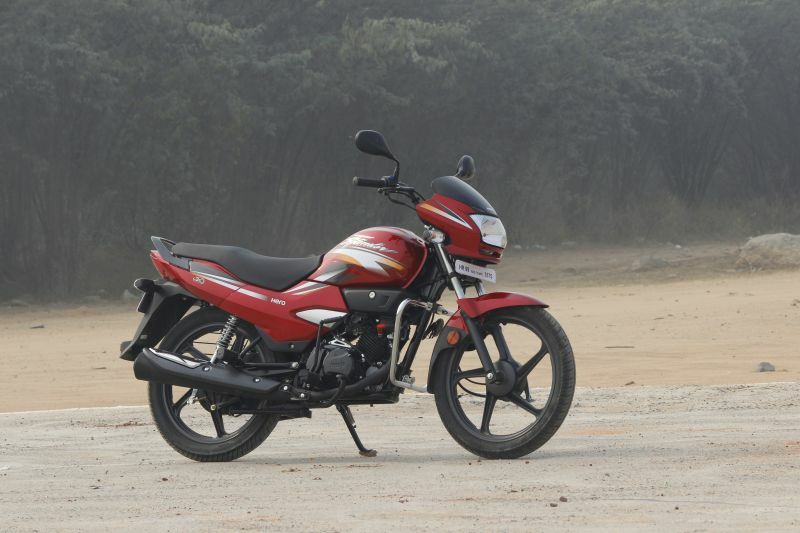 Hero MotoCorp have continued to manufacture 100-cc commuters under the successful Splendor name, and have expanded the brand to include the Super Splendor that you see splashed across these pages, their entry-level 125-cc offering. 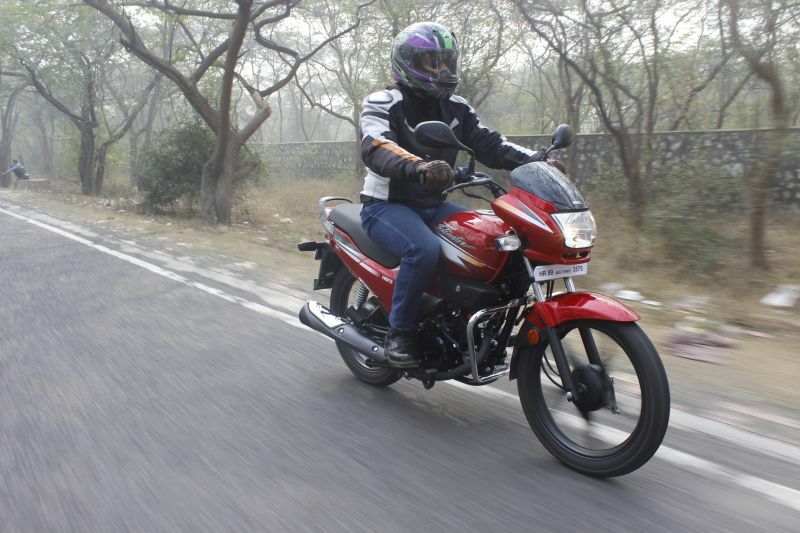 Slotting in under the better equipped Glamour and sharing the same 124.7-cc, air-cooled single, the Super Splendor lacks the bells and whistles of its more expensive cousin, but comes across as a basic and reliable commuter. The paint finish looked great, although after spending some time with the motorcycle I did get the impression that the build quality could have been better. The blacked-out handle, grab-rail, engine, exhaust, and wheels give the bike an understated yet classy demeanour. The riding position is upright and comfortable and the bike felt right at home filtering through Delhi traffic. The seat is wide, supportive and spacious, and only 785 mm off the ground, which means even short riders should have no problem in getting both feet down comfortably. Ergonomics are spot-on and all the controls fall easily to hand; however, the switchgear, though sturdy, looks somewhat dated. 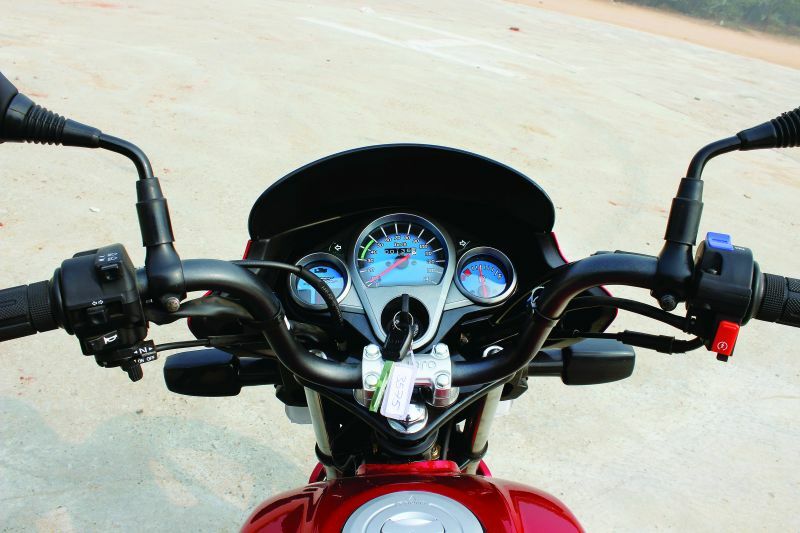 The instrument cluster includes a large, centrally placed speedo, with two more round dials to either side; one holds a fuel-gauge while within the other are the usual tell-tale lights for neutral, high beam and turn signals. Although the large, blue-backed dials are easily decipherable, the same can’t be said for the tell-tale lights, which are overcome by glare on a sunny day, and partially obstructed by the clutch cable. Once on the move, the ride is comfortable and pliant; the front telescopic fork and twin shocks at the rear do a great job of absorbing undulations and potholes, and the softly-sprung setup felt great for commuter duty. The Super Splendor comes shod with rubber from TVS Tyres; a 2.75-section tyre does duty up front while the rear is endowed with a 3.00-section, and these are mounted on 18-inch alloy wheels. I was quite amazed by the grip and confidence offered by these tyres, especially when we hit a bit of gravel during the ride. The refined engine makes 11.5 PS at 7,500 rpm and 11 Nm of torque at 6,000 rpm, and it is mated to a smooth-shifting four-speed ‘box and provides usable power right off idle. This bike is meant to be an urban commuter and Hero have got the gearing just right for this purpose; it is possible to potter around town in fourth gear without needing to downshift, and there was no sign of knocking till well below 20 km/h. Roll the throttle open and the Super Splendor accelerates smoothly, although vibrations start to creep in above 60 km/h. 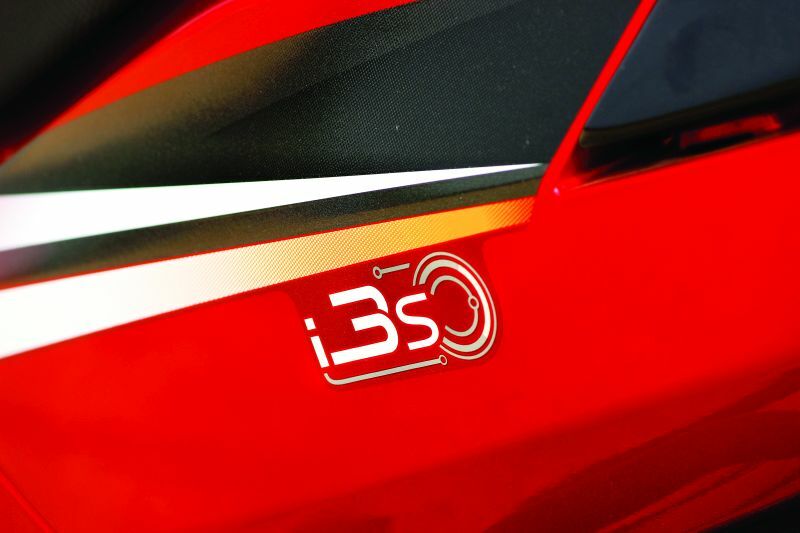 Although this bike will probably have a top speed in the region of 100 km/h, the engine feels happiest between 40 and 60 km/h in top gear and, considering the target market, this is probably where the bike will spend most of its time. The Super Splendor 125 is equipped with Hero MotoCorp’s ignition stop-start system, or i3s, as the company calls it, and I am happy to report that the system performs flawlessly in stop-and-go traffic. Incorporated to boost fuel economy, the system shuts off the engine seconds after you shift to neutral at a signal and restarts the moment you pull in the clutch to engage first gear before pulling off. This relatively simple system does a great job of saving fuel in urban riding conditions and can be switched off via a toggle on the throttle side of the handlebar if it gets too intrusive. 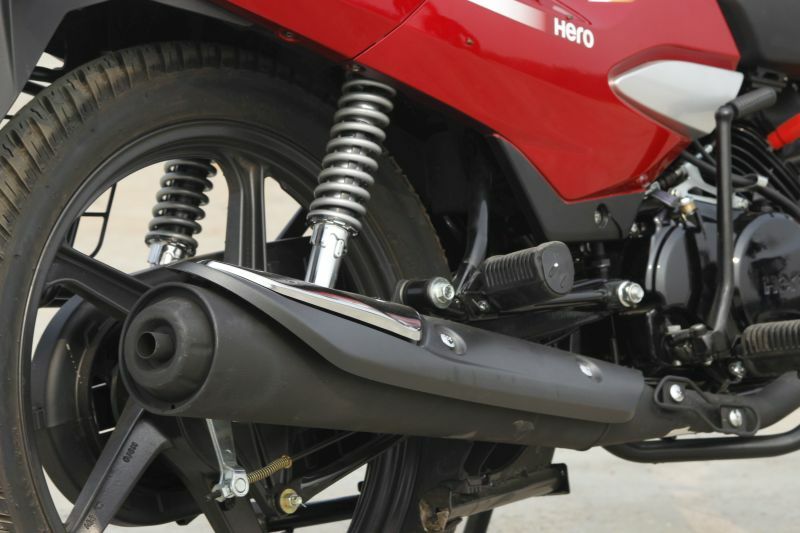 Being Hero’s entry-level 125-cc motorcycle, it is important to keep costs down; however, the lack of a disc brake on this motorcycle is something that needs to be addressed. The Super Splendor is slowed by 130-mm drums front and rear, and although these provide decent stopping power, they do not provide the sense of security that the superior bite of a disc brake brings. I raised these concerns with Hero’s Chief Technology Officer Markus Braunsperger, the man behind the development of the company’s current range of motorcycles. He did make it clear to me that the Splendor range has always been about basic, no-frills commuting at an attractive price, and customers interested in a higher-spec 125 can always opt for the Glamour, where they get a contemporary design, more colours to choose from, a front disc brake and newer instruments featuring a digital display. 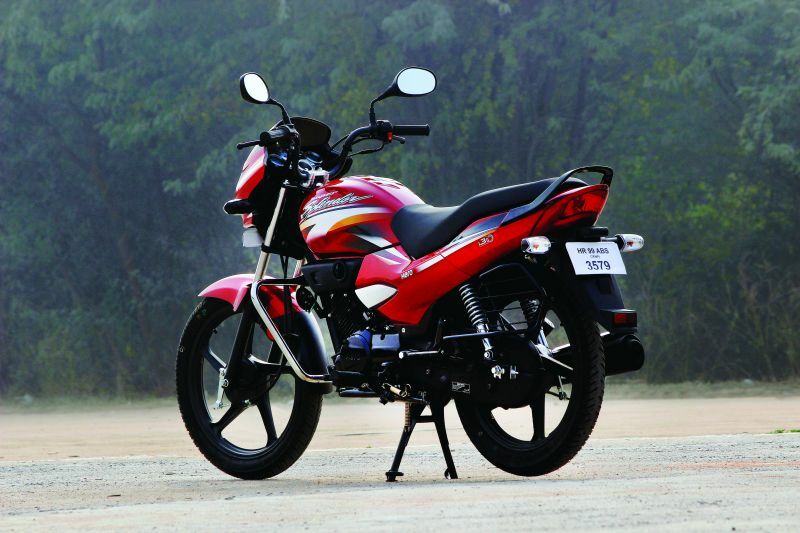 After spending half a day with the 2017 Hero Super Splendor 125 in Delhi’s traffic, I came to the conclusion that Hero have successfully created a no-nonsense, dependable commuter for buyers on a budget who just need to get from point to point within the city. This was the ideology behind the original Splendor all those years ago, and the Super Splendor proves to be a fitting evolution of this efficacious brand.